St. Dominic Savio Catholic High School is proud to announce that Tim Prukop has joined the school's Athletic Department as the Head Football Coach. Mr. Prukop has been involved in football for his entire life as the son of a football coach, Al Prukop, who coached for thirty-eight seasons, and he himself has coached for twelve years. Mr. Prukop is back to the Savio community, after serving as a founding member of the first Advisory Board for St. Dominic Savio from 2010 to 2012 advising the President of the school with Marketing. In 2014, Mr. Prukop also served on the Ad Hoc Committee for Communications as part of the Pastoral Plan for the Diocese of Austin. Before becoming a football coach and advisory member, Mr. Prukop was an All-Angelus League Defensive End at Servite High School in Anaheim, CA on the 1982 Friar team that won the CIF Southern Section Div. I Championship. That season ranked #1 in the state of California and #3 nationally by USA Today. He continued his playing career as a linebacker at UC Davis earning All-NCAC Conference honors his senior season and a Bachelor of Arts degree in Political Science. Under the guidance of College Football Hall of Fame Coach Jim Sochor, UC Davis won the NCAC Conference Championship in each year, and competed in the NCAA Division II playoffs three times while Mr. Prukop was an Aggie. Mr. Prukop then went on to earn a Master’s Degree in International Relations from Arizona State University where he was a Graduate Assistant football coach for the Sun Devil’s in 1988-1989, and responsible for video and assisting with the Linebackers. Mr. Prukop also assisted on defense at the University of Southern California from 1993-1996 during which time the Trojans won the Pac10 Championship twice and victoriously won the 1993 Freedom Bowl vs. Utah, 1995 Cotton Bowl vs. Texas Tech, and 1996 Rose Bowl against Northwestern. After the Rose Bowl victory, Mr. Prukop was hired as the Defensive Coordinator by the Amsterdam Admirals of the NFL Europe and there he led the top defensive unit of the league, during the spring season in 1996. In the Fall of 1996, Mr. Prukop accepted a position to teach and coach at Santa Margarita Catholic High school, and the team improved13-1, and won the CIF Southern Section Div. V Championship. During that season, Santa Margarita's defense set a record for the fewest points ever allowed in the CIF post season when only 6 points were scored against the Eagles during their final five games. 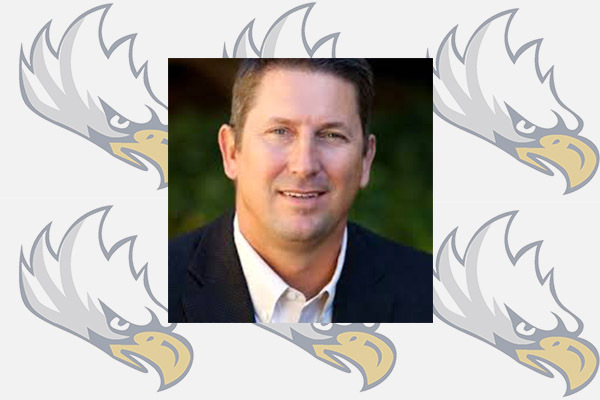 Mr. Prukop then returned toServite High School as its Defensive Coordinator from 1997-99 before stepping away from football to focus on raising his four children and pursuing a career in technology sales. The Prukop family moved to Austin, TX in 2000 when his company (Exodus Communication) asked him to start up the sales office here. 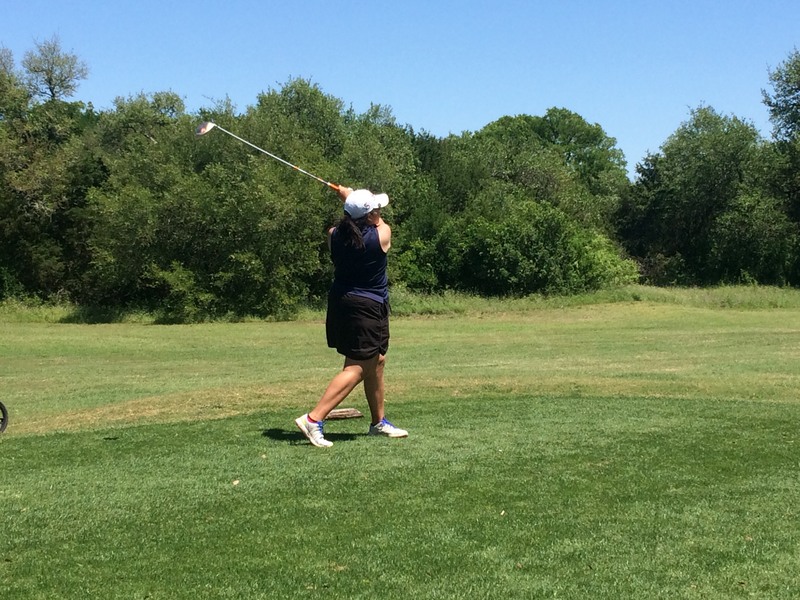 Since moving to Austin, Mr. Prukop has been actively involved in youth sports and high school sports holding various board level positions with many youth sports organizations and high school booster clubs. In 2012, the Prukop's opened 1UP Sport Performance, an athletic performance training facility in Cedar Park, TX that focuses on the development of speed and strength for athletes trying to take their game to the next level. 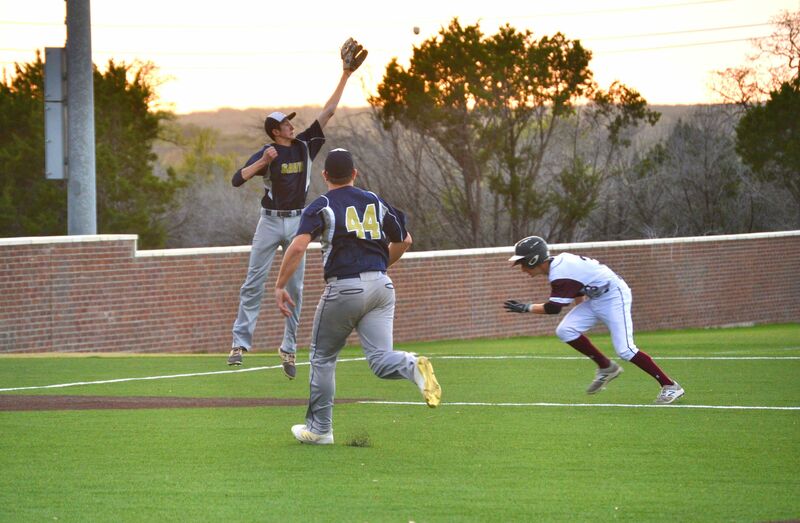 On Monday, April 23, the Savio Eagles baseball team hosted the Hyde Park Panthers in a conference rematch. Senior Brandon White started the game pitching for the Eagles with sophomore Gage Nusbaum and freshman Tucker Martinez coming in to finish the effort. Junior Nic Bianchi recorded two put-outs at home plate with a couple of outstanding throws from left field. White sparked the offense with a stand-up triple to the center field fence. The Eagles rallied in the bottom of the 7th inning but fell short, losing to the Panthers 8-6. The Eagles will travel to St. Michael’s on Wednesday, April 25, for a 7:00 PM start against the Crusaders. On Friday, April 27, the Eagles will finish the season with a rematch at Hyde Park, also starting at 7:00 PM. 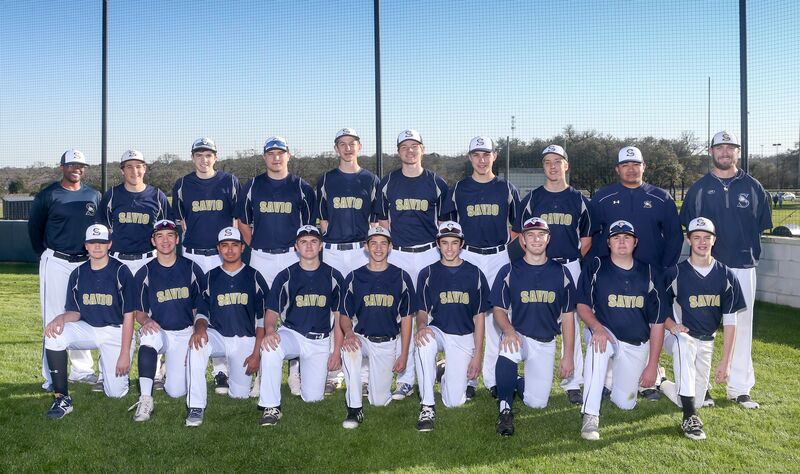 Thank you for supporting Savio baseball this season! Go Eagles! On April 14th, 2018 the Savio Women of God Club hosted their first annual Spring day retreat. Many activities, giggles, memories, and fun were shared by all. Glass jar decorating, Red Rover Red Rover, tie-dye, and many more activities were enjoyed and bonding was fostered between each of the girls in the club. A talk given by Esther Castwell about placing our complete trust in the Lord. She talked about how the Lord is always at the center of hearts and minds in every person. Each of the young women experienced a new friendship with each other as well as in Christ, especially during Eucharistic Adoration at the center of the retreat. Lady Eagles take the lead in the series(2-1) with a 7-5 win over Hyde Park Friday night. The ladies played great defense and had solid hitting. Elle Brannam had a beautiful hit with a long ball over the centerfield fence. The lady Eagles have a chance to defend their district title Tuesday night at home against the Panthers. 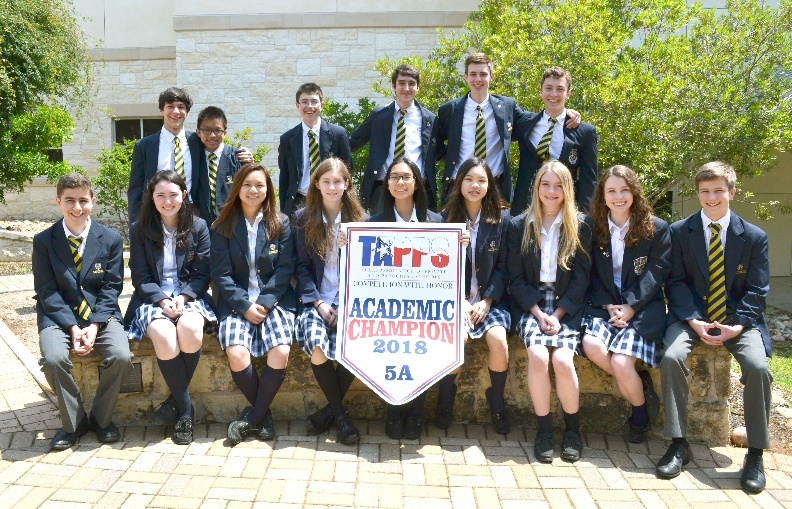 This year, fifteen St. Dominic Savio Students competed in the TAPPS State 5A Championship. On April 12, 2018, St Dominic Savio students returned home as state champions for the second year in a row. Students competed in nineteen events ranging from Writing, Spelling, Current Events, Humanities (Poetry interpretation, solo and duet acting, Prose interpretation, and persuasive speaking), and Mathematics (calculator, number sense, advanced mathematics, and science). All fifteen students competed against 22 schools in the state of Texas. Points were awarded each time as students placed in the top eight at the state level. This year, Savio had eleven students win a total of nineteen medals. Savio students received the total number of points as well as highest number of medals. Savio students won 106 points overall, 10 points above second place, exceeding all 21 other schools. This year’s team results, included many firsts for the school. For the first time in school history students placed in six additional events than last year. They were poetry interpretation, prose interpretation, original oratory, duet acting, social studies, current issues and events. A number of underclassmen performed extremely well, indicating a strong potential for future years to come. Jonathan Shoemaker: Advanced Math (1st place), Number Sense (1st place), Calculator (1st place), Science (2nd place) with the Top Chemistry award, Current Events (7th place), and the Top Overall Scorer Award. St. Dominic Savio is located in Northwest Austin, Texas (9300 Neenah Avenue, Austin, TX 78717), in an active and thriving community. 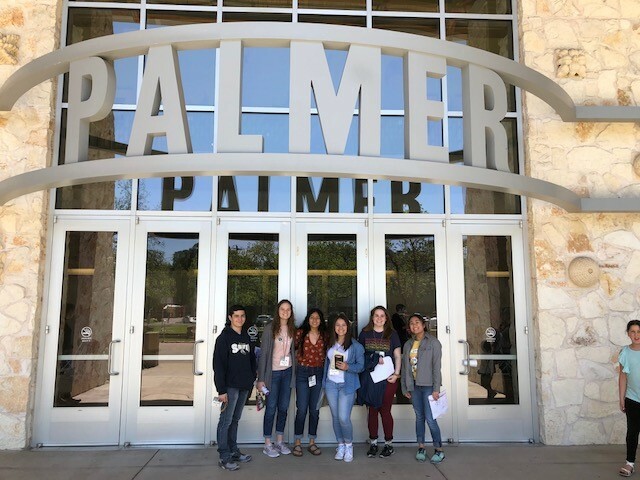 St. Dominic Savio is a college preparatory school founded by the Diocese of Austin in 2009, to prepare young men and women to become faith-filled, visionary and inspirational leaders in service to the Church and the world. St Dominic Savio offers a faith experience that will encourage all students to reach their full potential as caring, conscientious, and moral servant leaders. The vision is "Forming Servant Leaders in the Image of Christ.” For any inquiries, please contact the school President, Dr. Joan Wagner or Mrs. Cristina Almanza (calmanza@saviochs.org), the Director of Communications at 512-244-4811. 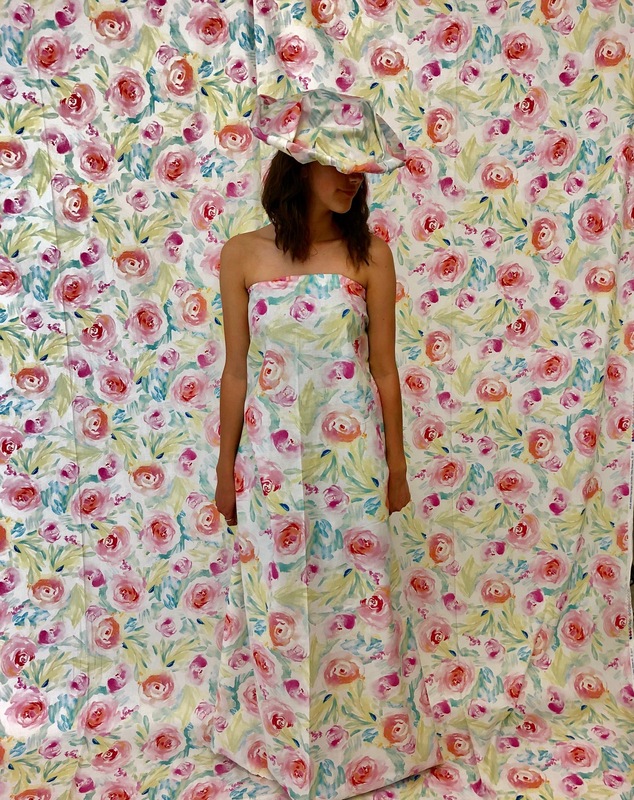 Savio Advanced Photography students collaborated to create large-scale, camouflage works of art. 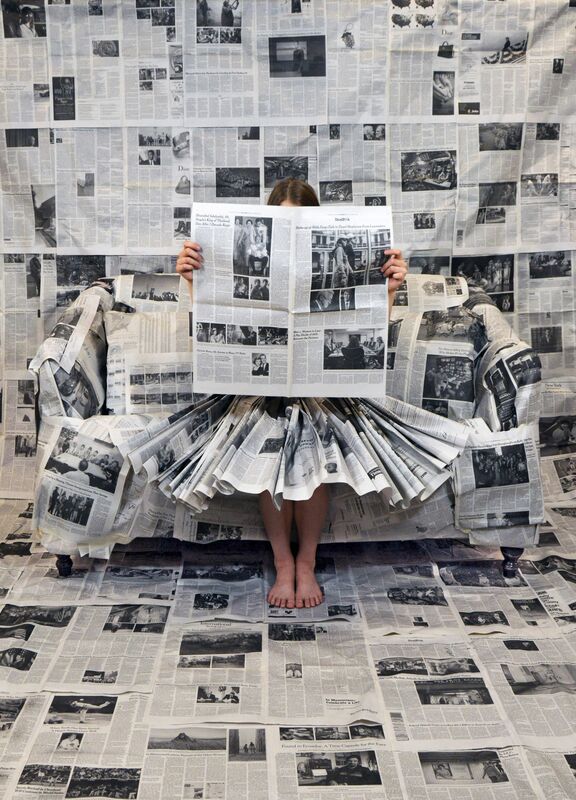 Each scene was set up in the art room where students worked collectively to shoot, edit and print their pictures. The Savio photography program teaches every student about the proper operation of their DSLR cameras and how to use Photoshop - the industry standard in photo editing software. Congratulations to our students for their hard work as they were able to refine their skills in photography. 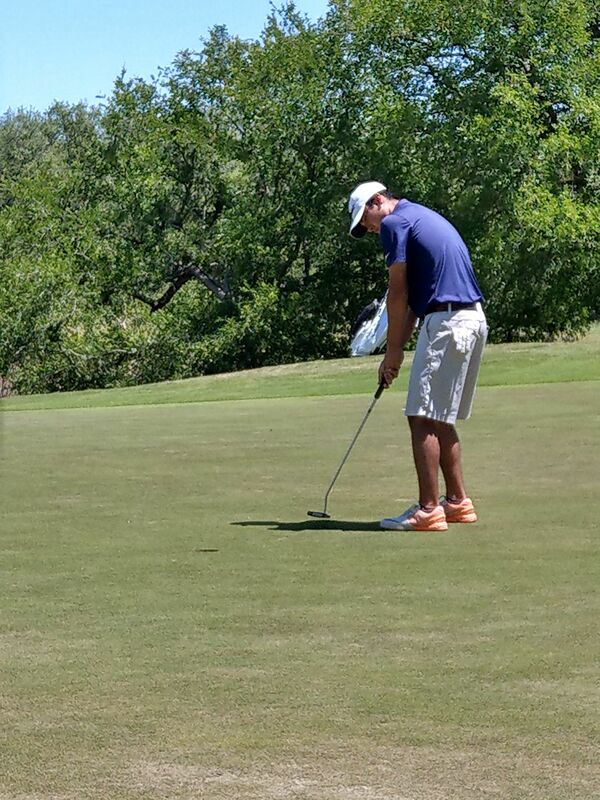 Savio's Eagles and Lady Eagles golfers competed Monday in the district tournament at Grey Rock Golf Course, a site of past successes for the teams. Unfortunately, the teams' totals were not quite low enough to advance to regional play. In an uncanny repeat of the boys' previous two appearances at district, the girls' team fell just a single shot short of advancing. The day started calm, with little wind and a pleasant coolness in the south Austin air. 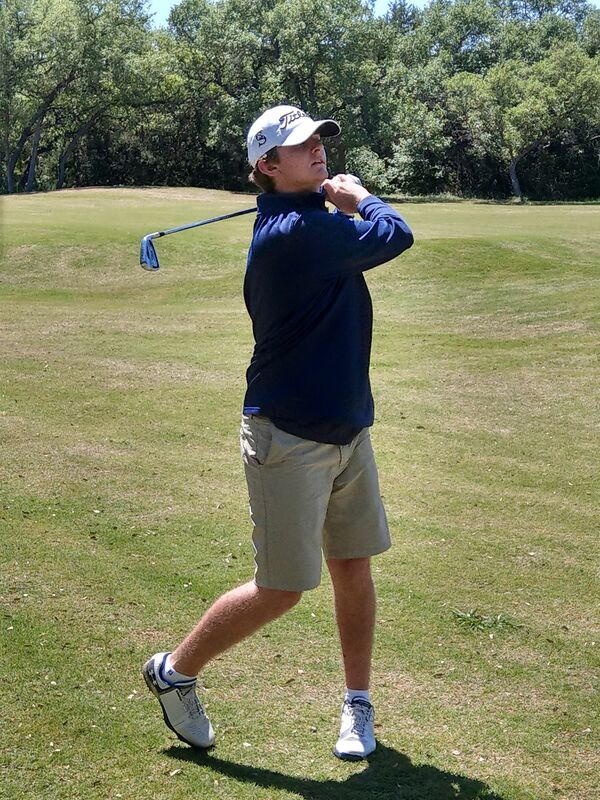 By the end of the day, in a steady wind, the boys found themselves unable to make up ground on the regional qualifiers, who were led by the strong play of Midland Christian. The bright spot of the day for Savio was the play of freshman Vera Yi, who will advance on to regionals in the individual competition. Yi shot an impressive 82 to earn second-place medalist honors, and will represent Savio at River Place Country Club next Monday. 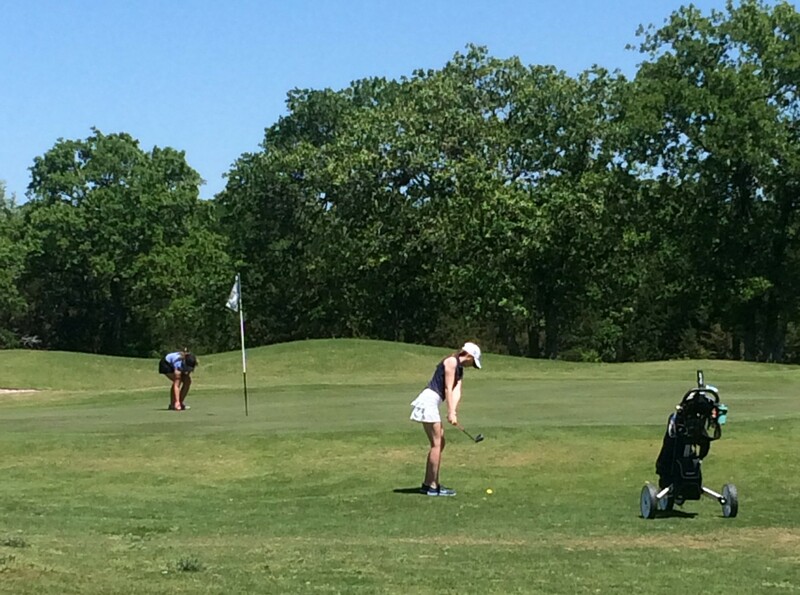 Wish Vera luck as she competes against the best lady golfers in the region! Mr. Daniels traveled to Notre Dame University last week, along with Mr. Whitworth, the Assistant Superintendent of the Catholic Schools office, and Mrs. Gee, Principal of St. Louis Catholic School. 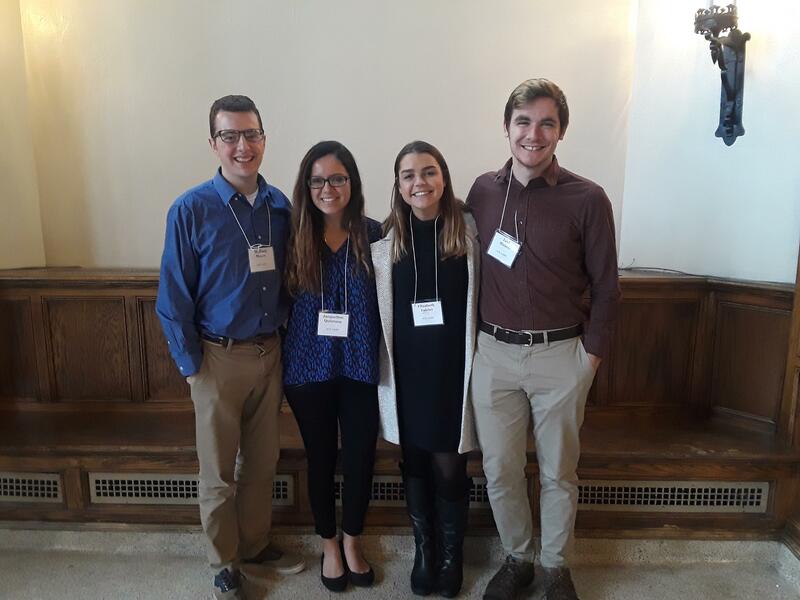 They traveled to meet the four new ACE teachers who will be serving in Diocese of Austin for the next two years. ACE is the Alliance for Catholic Education. ACE is a Notre Dame program that places college graduates as teachers at Catholic high schools in communities throughout the United States. ACE teachers live and work in their assigned communities for two years while they earn a Master's in Education from Notre Dame University. Next year, St. Dominic Savio will be gaining Mr. Levi Biasco, pictured in maroon on the right. We are thrilled about their commitment to serve in the Diocese of Austin! 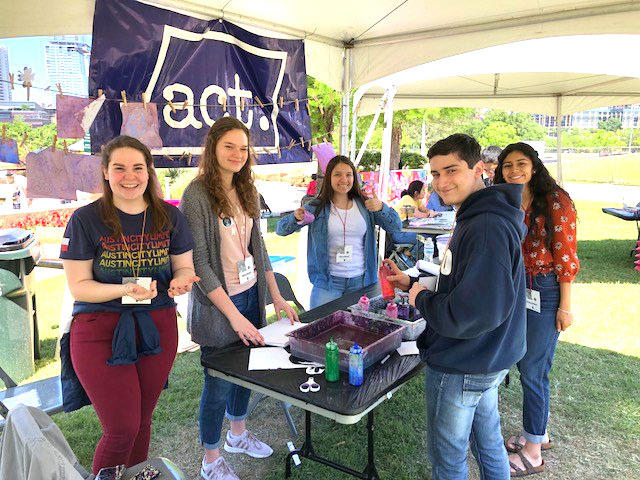 Over the weekend, student members of the National Art Honor Society volunteered downtown at the Art City Austin festival at the Palmer Event center. Art City Austin Festival is the longest running art festival in Austin and is in its 68th year. 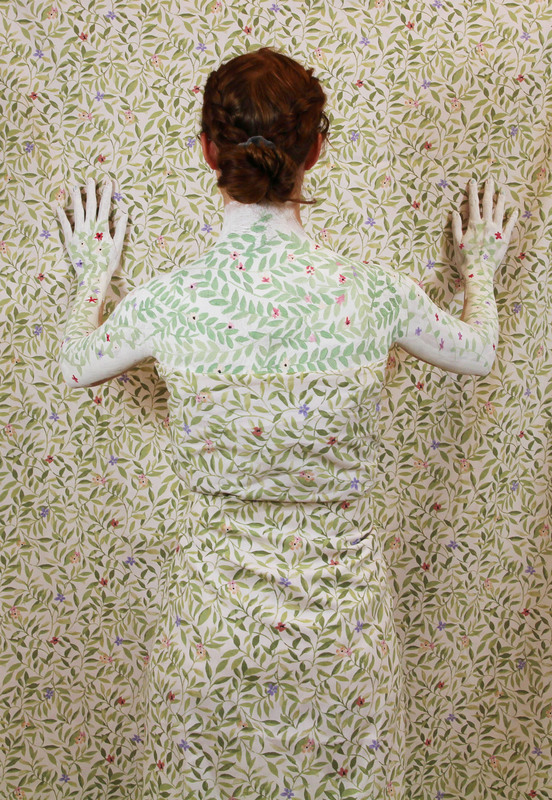 The festival attracts many local and visiting artists to view fine art performances, music, and art installations. 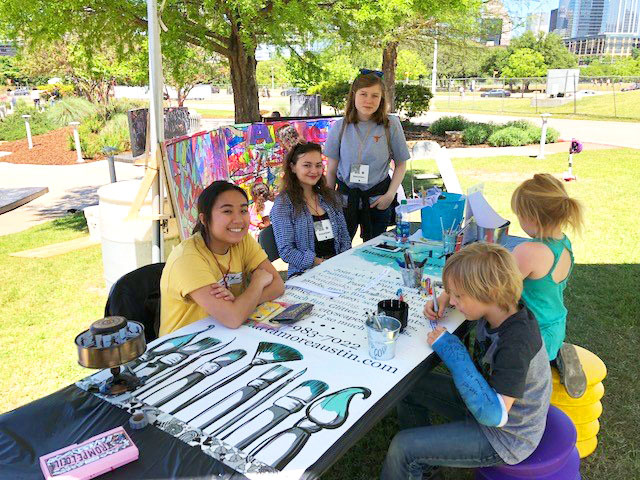 The NAHS members volunteered in the Children's Activity Tent and helped young artists create their own works of art. 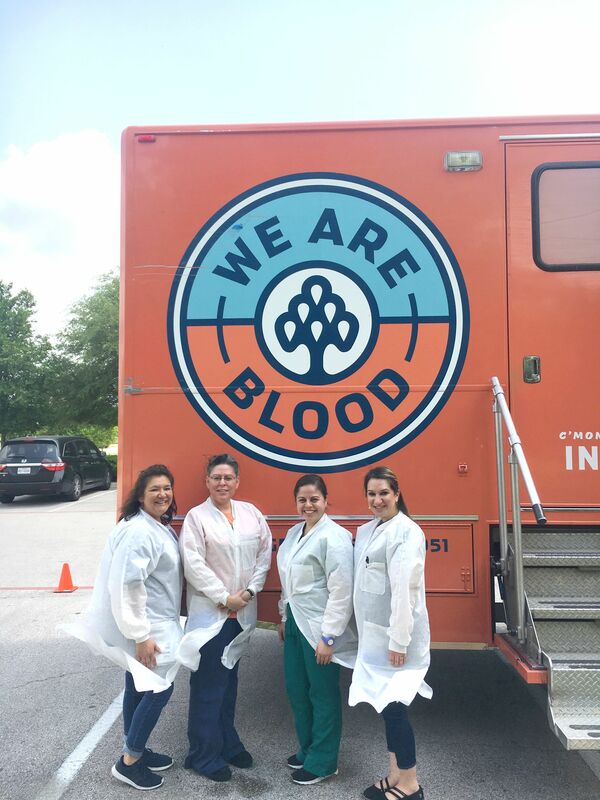 Savio had its first Blood Drive today in effort to broaden awareness about the ability to donate a resource that unities us all and can save lives. The donation event was coordinated by one of the Christian Outreach club members, Peyton Kilburn, who is completing her senior project for the school. As a result of her efforts, a total of 32 people gave, or attempted to give, their blood and there was a total of 24 pints collected today. 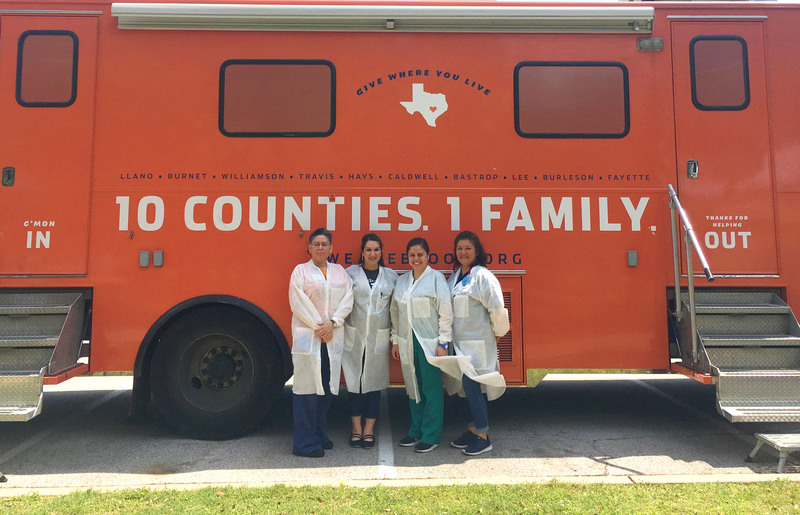 Any Savio community member can still give blood at any of the We Are Blood Donation locations around Austin, and Round Rock. If you donate, please mention St. Dominic Savio Catholic High School and they will add it to the grand total. 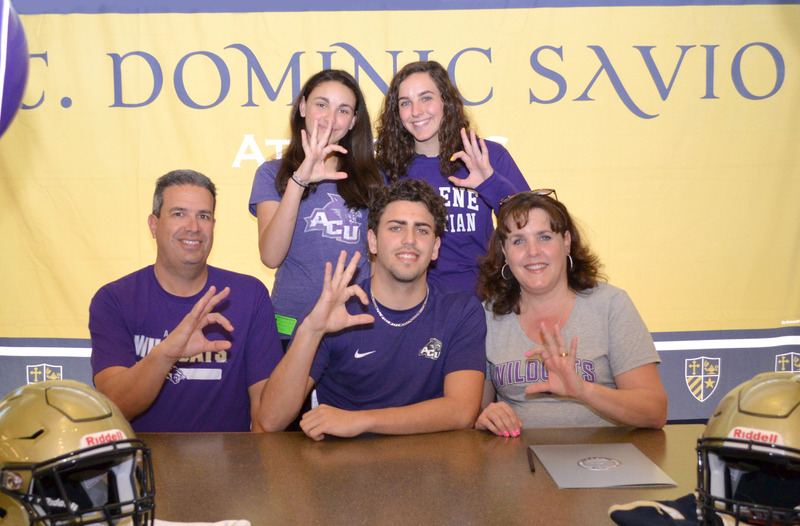 It has become a tradition to celebrate athletic signings at St. Dominic Savio. 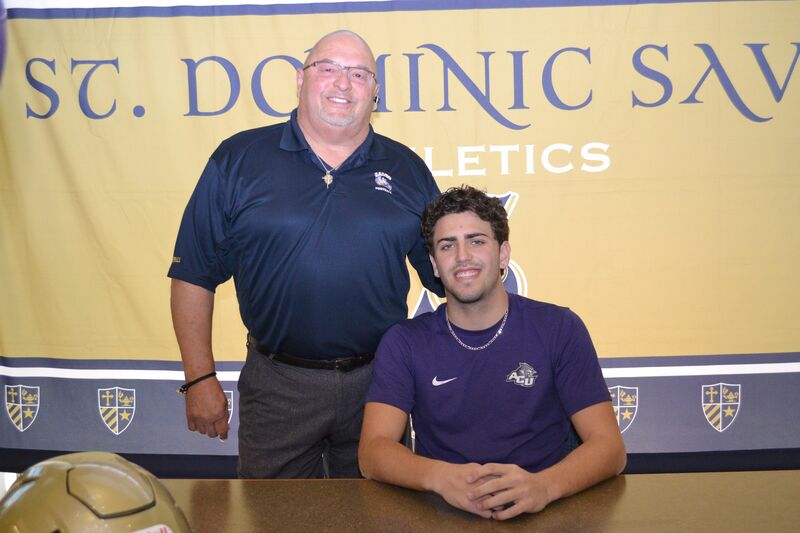 On Tuesday, April 10th Mark Lacayo signed to play football at Abilene Christian University in the fall. We celebrated the event by inviting Mark's family and friends to hear a congratulatory speech from his football coaches. 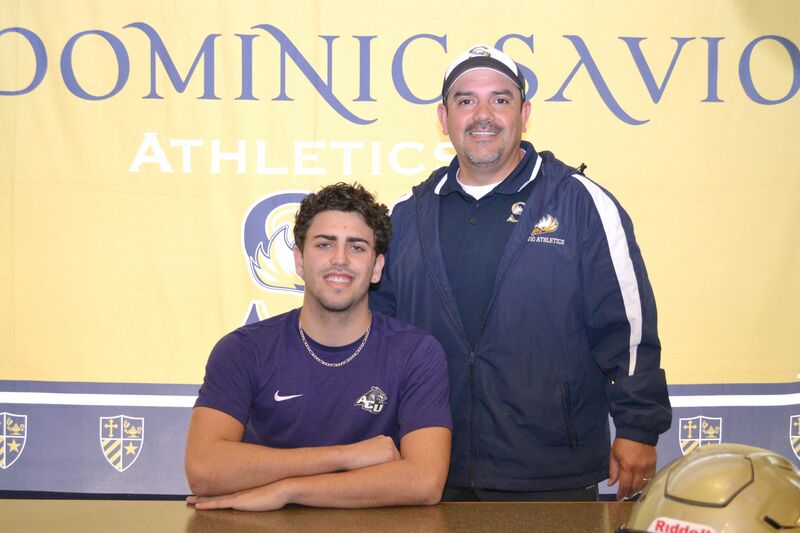 We are proud of Mark Lacayo and his representation of Savio as he plays at Abilene Christian in the future! 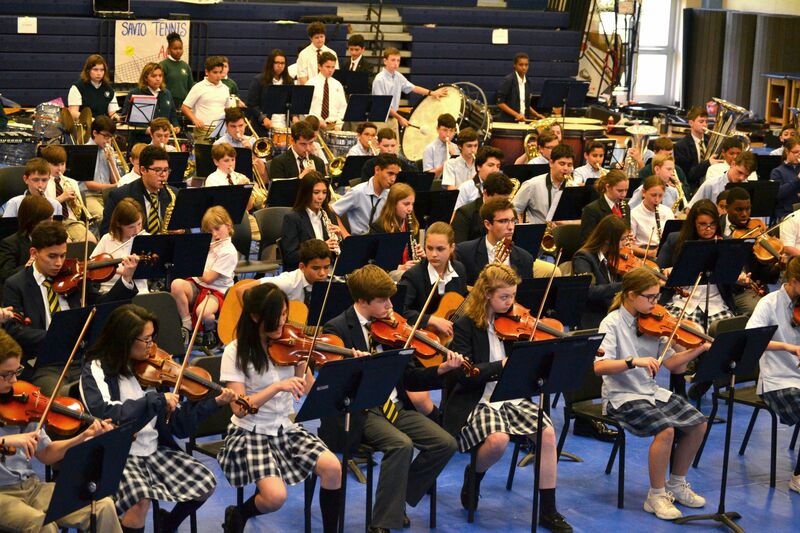 On Friday, April 6, 2018, St. Dominic Savio Catholic High School hosted the Diocese of Austin Band and Orchestra Festival in the Gym. 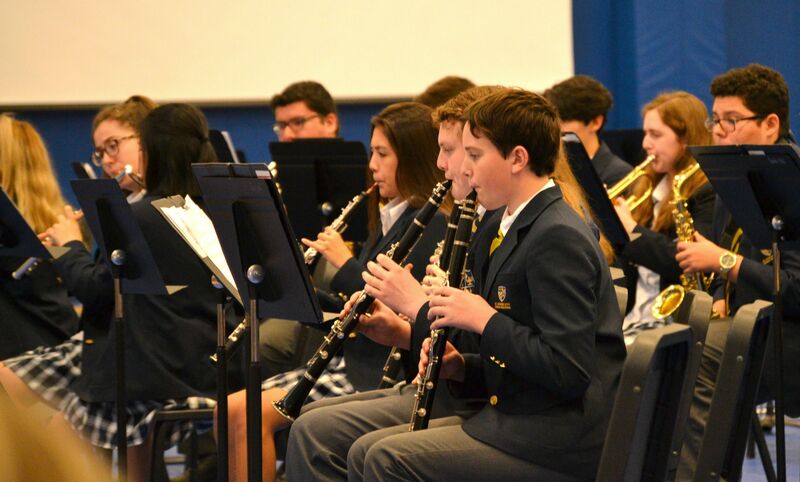 Many students from surrounding Catholic school bands and orchestras descended upon the campus to participate in the festival. Two ensembles performed from St. Dominic Savio. 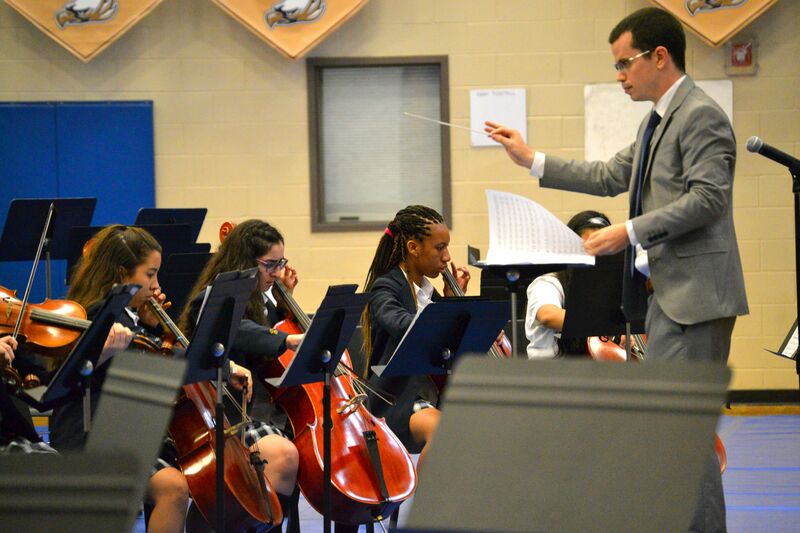 The String Orchestra played three lively songs, "Dos Fuegos" composed by Robert Sieving, "Forever Joyful" by Brian Balmages, and Quintus by Larry Clark. The Wind Ensemble played two energetic and emotional pieces, "Sparks" composed by Brian Balmages, and "Beyond the Seven Hills" by Michael Sweeney. 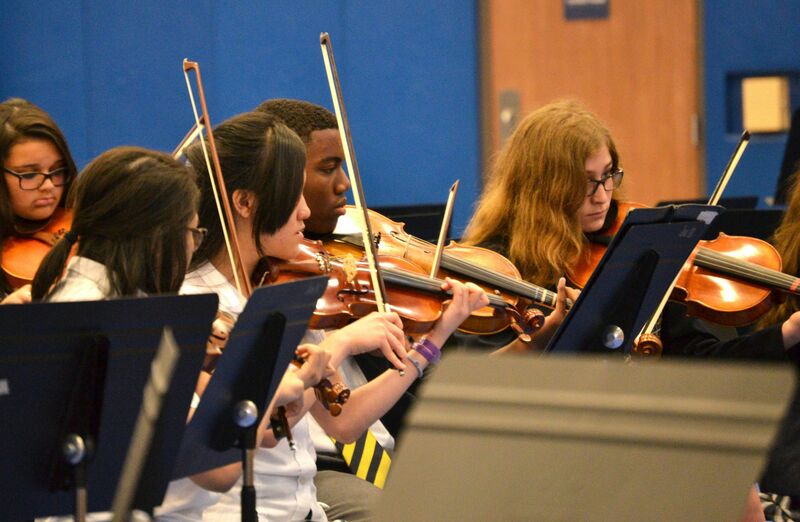 Once all the bands and orchestras had finished playing their pieces, all of the schools joined together to play "The Tempest" composed by Robert W. Smith. 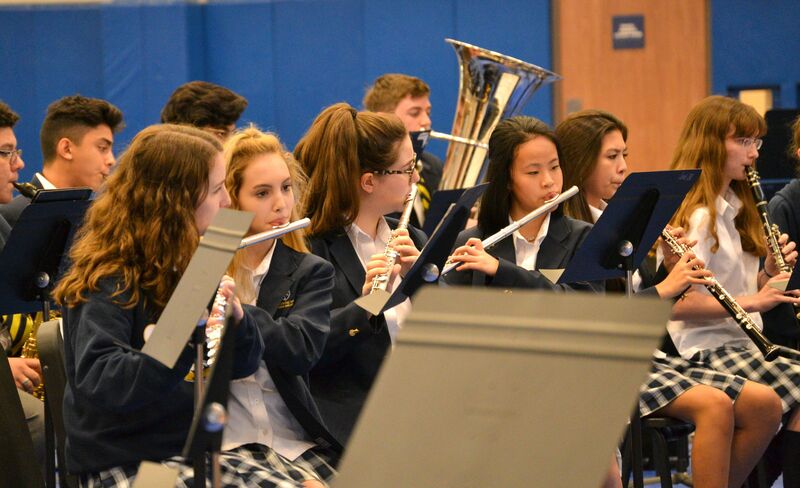 The sound of all the bands and orchestras filled the gym with a voluminous, instrumental sound! Thank you to all of the parent and staff volunteers for their support of this event. 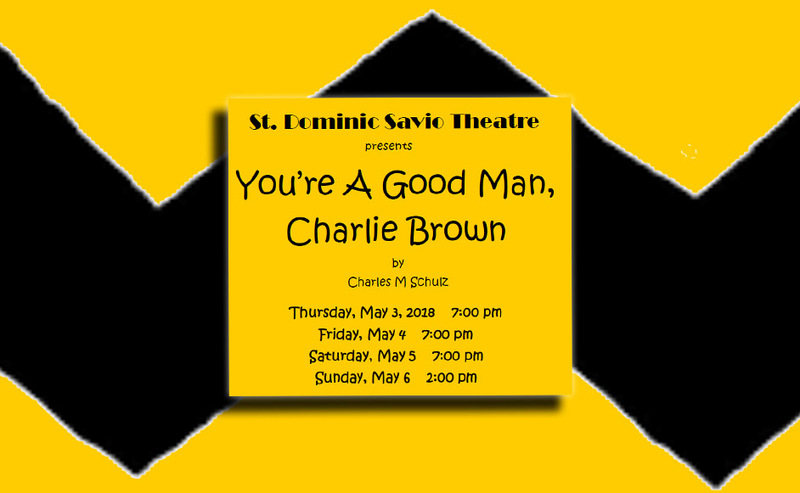 The Savio Musical Theatre will present You’re A Good Man, Charlie Brown in the Savio gym on Thursday, May 3, 4 and 5 at 7:00 PM and Sunday, May 6 at 2:00 PM. You’re A Good Man, Charlie Brown, is a musical comedy from 1967, with music and lyrics by Clark Gesner. The Story is based on the characters created by Charles M. Schulz, in his famously known comic strip Peanuts. Buy your tickets online or at the door. It’s a fun show for all ages, please come out to support the Savio Fine Arts department! This year's TAPPS 5A District 2 tennis tournament has come and gone, but not without it's share of stunning matches and memorable moments. 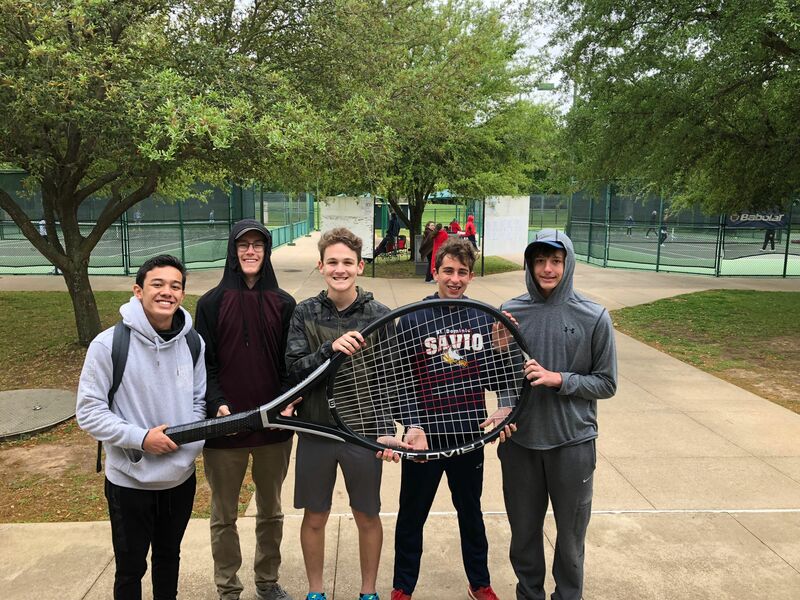 The tournament was hosted by St. Dominic Savio's head tennis coach, Garrett Pekar, along with help from the athletic directors Crystal Clark and Orlando Florez at the Waco Regional Tennis Center on April 6-7. On the first day of match play, the sun was shining and players were feeling toasty on the courts, but a storm and cold front had blown through the area on Friday night making Saturday's matches much colder and windier affairs than the day prior. It took determination for the players to battle the elements as well as the opponents and leave victorious on the second day. Fabian Yanez, freshman, and Trevor Staebel, senior, represented the Eagles in boys' singles. Yanez narrowly lost his first round in a three-set match, and then won one round in consolation before he was knocked out of the tournament. In boys' doubles, senior players Connor Woods and Pedro Untalan faced some of the top teams in the tournament and fought hard to make the competitions close. 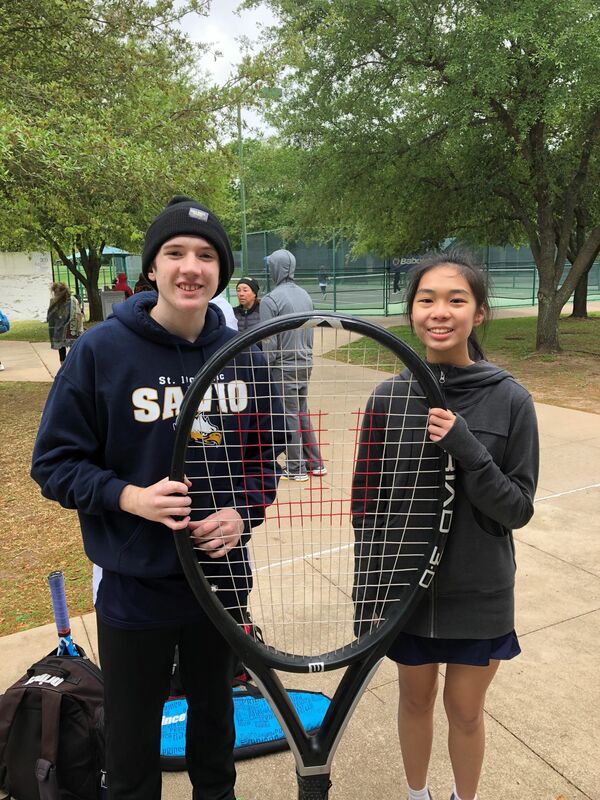 Tulan Le, senior, and Abigail Staebel, sophomore, played girls' singles for Savio, but again went toe-to-toe against tough competition and lost to several strong players. In girls' doubles however, Blaise De Oliveira, senior, and Izabella LaPointe, junior, won their first match with ease, showing good sportsmanship and teamwork along the way. In the next round though, they played the defending district and state champions from St. Michael's Catholic Academy and were not able to beat them. Isabel Helal, junior, and Savanah Miller, freshman, showed the most chemistry during the tournament and came away with the most wins for the Eagles. The girls defeated Hyde Park's team of Larkham and Owens 6-0, 6-3 in the first round. Next, they faced the eventual silver medalists Robbins and Donnelly from Regents. Helal and Miller took a game off of the duo, but were unable to beat them this time. In the consolation bracket, the girls made quick work of teams from Regents School and Grapevine Faith Academy to win consolation. 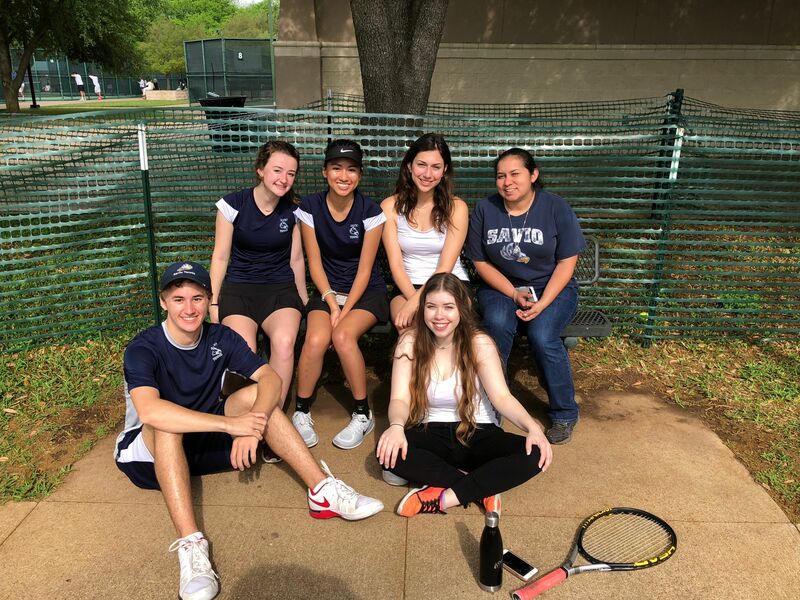 Helal and Miller were given a chance to playback the fourth place team for a chance to qualify for the state championships of TAPPS, and fought out a close match in the cold on Saturday. After splitting sets with St. Michael's Thweatt and Rangel-Medina, the girls narrowly lost the match 6-4, 6-7, 6-2. Congratulations to Isabel and Savanah for earning fifth place and becoming the state alternates. The tournament was a great event overall, and it was inspiring to see the players' hard work help them through some close matches. The Eagles Tennis team has one more match to go for the season against Regents School on April 13. On Friday, April 6th, our Savio Eagles baseball team traveled to Hyde Park for a rematch with the Hyde Park Panthers. Behind the stellar pitching of senior Skyler Robinson, and the timely hitting of junior Alex Valastro, the Eagles recorded a big conference win over the Panthers, beating Hyde Park 4 to 2. Valastro led the hitting effort with a double and a single, collecting 2 RBIs. Robinson sent one soaring into the outfield for a triple and 2 RBIs. In the bottom of the 7th inning, after a lightning delay, freshman Josh Stewart came in to close the game for the Eagles. Savio put down a 7th inning threat by the Panthers with a heads up play by Valastro to get the third out at home plate for the win. A solid performance by the Eagles. Savio students -- don't forget to come to the next home game and try and win a "Support Savio Baseball" giftcard! The next home game is Tuesday, April 10th against the Austin Royals. Come out and support your Savio Baseball team! 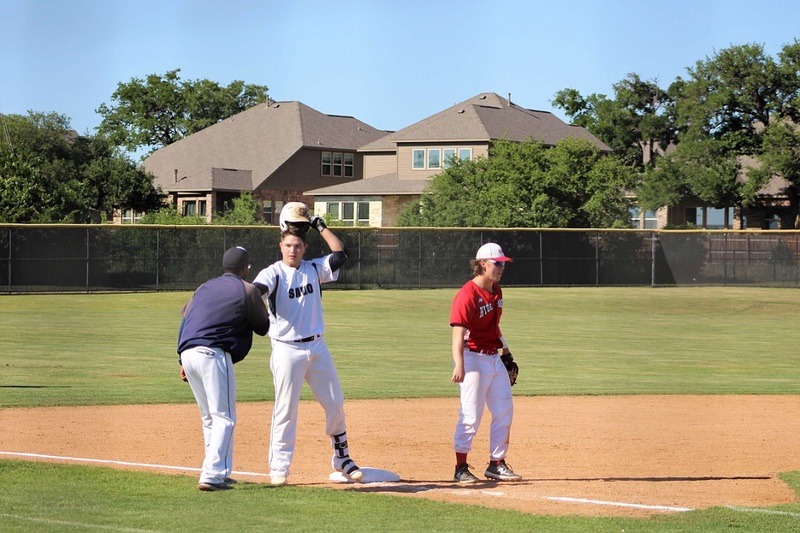 On Tuesday, April 3rd, the Savio baseball team hosted the Hyde Park Panthers in a TAPPS Division II District 4 Conference match up. Brandon White and Matthew DiTeresa pitched for the Eagles. The Savio bats came alive in the bottom of the 4th inning with Matthew Raebay, Josh Stewart and Brandon White recording hits to help score pinch runner Joseph Gaona. The Eagles lost after a hard fought game but will meet the Panthers again tonight, April 6th at 6:00 pm at Hyde Park. Savio Freshmen Noah Young and Izzy Rivera both won $25.00 "Support Savio Baseball" gift cards by naming all the seniors on the baseball team and knowing who won the World Series title last year. Every Savio student attending a home game will have the opportunity to try and win a gift card. Come out and support your Savio Eagles baseball team!